To see a Western Grebe floating serenely on the lake, its long white neck punctuated by the black comma of its head and nape, is to see grace itself come to life. “Grace” is an odd word in our language. It comes from the Latin word gratis, meaning “a pleasing quality.” Over the centuries, as Latin became more vulgar and eventually turned into French, the “pleasing quality of grace” came to mean “elegance of form” or “beauty of movement.” Along its way toward elegance and beauty, though, grace took a turn toward good will and also came to mean “favor” or “gratitude.” That is why devout people say grace before a meal and also why they pray for grace from God. 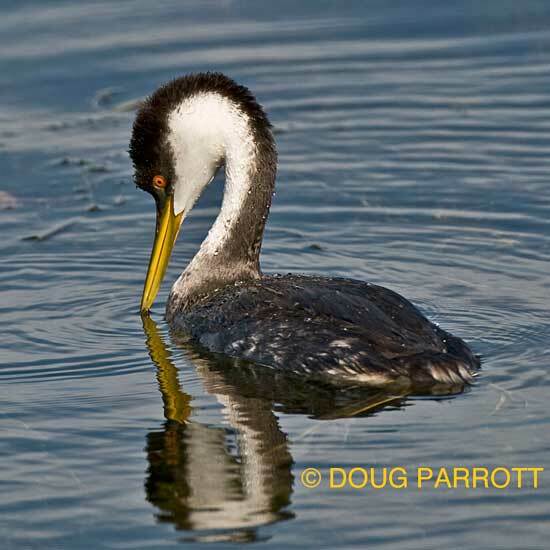 For me, the Western Grebes who grace the waters of Union Bay embody all the definitions of the word. They fill my eyes with elegance and my soul with gratitude, whether they are fishing for minnows, or briefly coming together to swim side by side, or floating with necks curved into telephone cords of folds so they can tuck their bills into their backs for a nap. To see them for yourself, you should walk out to the crewhouse at Conibear, where they hang out almost every day. They aren’t shy. If you walk slowly out onto the dock and make no sudden movement, in all likelihood, they will let you get close enough to see every feather. In this world of chaos and confusion, they are a great gift to all who seek grace of any sort. This entry was posted in Uncategorized on November 12, 2012 by constancesidles.